Hawaii's Kilauea volcano spewed ash nearly six miles (30,000 feet/9 km) into the air on Thursday and scientists warned this could be the first of a string of explosive eruptions in the crater. "This has relieved pressure temporarily," U.S. Geological Survey geologist Michelle Coombs told a news conference in Hilo. "We may have additional larger, powerful events." Residents of the Big Island were warned to take shelter from the ash as toxic gas levels spiked in a small southeast area where lava has burst from the ground during the two-week eruption, authorities said. The wind could carry Kilauea's ash plume as far as Hilo, the Big Island's largest city and a major tourism center, the County of Hawaii Civil Defense warned in an alert. "Protect yourself from ash fallout," it said. Geologists said the 4:15 a.m. (10:15 a.m. EDT) explosion was likely the first in a series of steam-driven blasts last seen in 1924, rather than "the big one" that nervous residents had feared as Kilauea was rocked by earthquakes in recent days. A spike in toxic sulfur dioxide gas closed schools around the village of Pahoa, 25 miles (40 km) east of the volcano, where lava from fissures has destroyed 37 homes and other structures and forced about 2,000 residents to evacuate. National guard troops were forced to don gas masks at a nearby road intersection, according to a Reuters reporter. Civil defense workers handed out one ash mask per family member in communities close to Kilauea, such as the village of Volcano, which was expected to receive a 1/32 of an inch (0.8 millimeters) dusting of ash, according to USGS estimates. USGS geologists and staff were evacuated from the Kilauea summit shortly before the explosion. 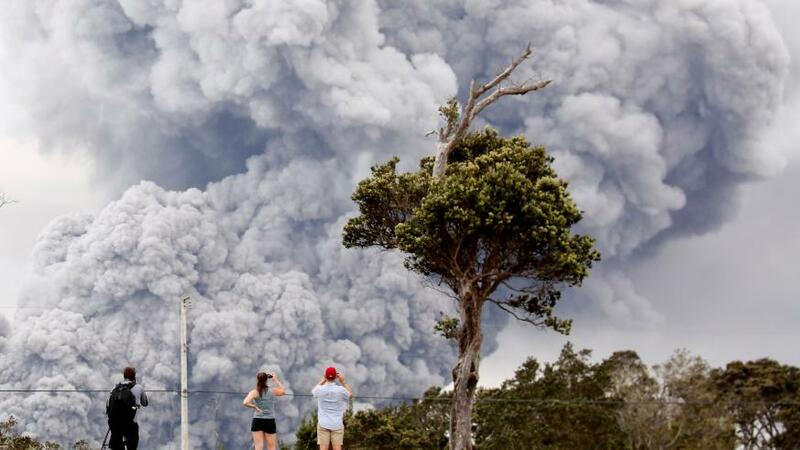 Thursday's eruption lasted only a few minutes, said Coombs who called it "a big event that got people's attention, but did not have widespread impact". "Tall but small," she said of Thursday's plume. An aviation red alert was in effect due to risks ash could be carried into aircraft routes and damage jet engines, USGS said. Passenger jets generally cruise at around 30,000 feet, the height of Thursday's plume. Pahoa fire station on Thursday morning recorded a "red level" of sulfur dioxide, meaning it would cause choking and an inability to breathe, Fenix Grange of the Hawaii Department of Health told a news conference in Hilo. "If it's red, it's get out of Dodge," She said. "We're trying to create a ring around sulfur dioxide so we can protect people." Across the Big Island, home to 200,000 residents, people were encouraged to avoid driving in ashfall areas, as the powdered rock makes roads slippery, and not go outdoors unless necessary. Geologists had warned that a chain of explosive eruptions could begin once Kilauea's falling lava lake descended below the water table, allowing water to run on to the top of the lava column and create steam-driven blasts. "I don't think there is a big one that's coming," said University of Hawaii volcanologist Scott Rowland. "I think it's going to be a series of explosions similar to the one that happened this morning, and that's based on what happened in 1924, which is really our only analog." In the 1924 eruption, which lasted 2-1/2 weeks, one person was killed by debris shot from the crater and areas as far as 35 miles (56 km) to the southwest and 30 miles (48 km) to the east were dusted with ash, according to the USGS. There have been no deaths or serious injuries reported during the current eruption.